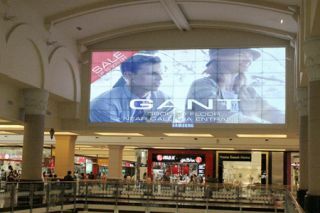 Dubai’s Mall of the Emirates, one of the largest shopping centers in the Middle East, is now home to a 54-monitor video wall powered by Matrox Mura MPX Series controller boards. Installed by ALMOE AV Systems and integrated by a local distributor, the wall displays dynamic digital signage content aimed at the 30-million-plus shoppers visiting the mall every year. Prior to this installation, the largest video wall in the mall was a 4x4, portrait configuration—less than one third of the size of the new installation. Tasked with enhancing the mall’s digital signage, ALMOE AV Systems and partner Mediasys, who provided local support, installed the 9x6 video wall. Comprising fifty-four 55” ultra-thin Samsung LCD monitors, the wall enables enhanced dissemination of mall activities and promotions. Mura MPX Series boards installed in a Matrox-validated 4U system capture and display the digital signage content on the wall. The Mura MPX boards are controlled remotely by OpenScreen’s Mura MPX Wall Controller Management software. The video wall content is also managed remotely by a Scala Digital Signage Platform and Samsung MagicInfo software. Mura MPX Series boards facilitate video switching, signal conversion, and scaling. The first PCIe x16 Gen2 board class to feature both HD inputs and outputs, Mura MPX Series integrates up to four of each on individual single-slot, add-in cards. Boards can subsequently be combined within single systems to power small to larger-scale walls. Housed within a Matrox-validated 4U system, a mix of Mura MPX-4/2 and Mura MPX-4/0 boards (featuring four outputs each and two and zero inputs respectively) powered the 54-monitor video wall. Universal input support enables the capture and display of digital signage content from external sources like the Blu-ray Disc player currently being used with the wall. Mura MPX also features HDCP compliance, so that copy-protected content from either a Blu-ray player or other sources like digital cable, satellite set-top boxes, and video streamers can be shown on compatible displays. ALMOE AV Systems worked at a height of over 11 m off the ground to install the video wall. Immediately visible to all who enter the atrium, it is a clear focal point for mall visitors.